Aloha. 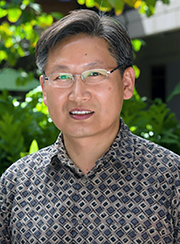 Welcome to the Center for Korean Studies at the University of Hawai‘i at Mānoa, the oldest and largest Korean studies institution outside Korea. Established in 1972, the Center has for more than four decades pursued its founding vision of developing and promoting Korean studies internationally. With more than forty faculty members offering courses or conducting research related to Korea, the Center has by far the largest number of Korean-studies scholars in any educational institution outside Korea. As an educational, research, and informational hub for Korean studies in the United States, the Center has broadened scholarship and the cultural horizon for students, faculty, and the Hawai'i community. Geographically situated at a strategic point, the Center also has played a key role in bringing together scholars and intellectual leaders. The Center regularly refines its programs and activities to keep abreast of developments in the rapidly changing global context of the twenty-first century—all with the goal of ensuring that the Center and the field of Korean studies continue to grow. On behalf of the Center, I invite you to be part of our community. Our legacy builds on our rich past, but it will also be part of the evolving present and future.